Is there tension in your relationship? ​Do you have fights that look like fighting or times when you don't talk at all? Do you feel bad about how you treat your partner or how your partner treats you? ​I get it because I've been there. I used to wonder why there was always something wrong in my relationship. I questioned if it was worth working on, or if I should just give up. It felt like the harder I worked on the relationship, the worse things got. 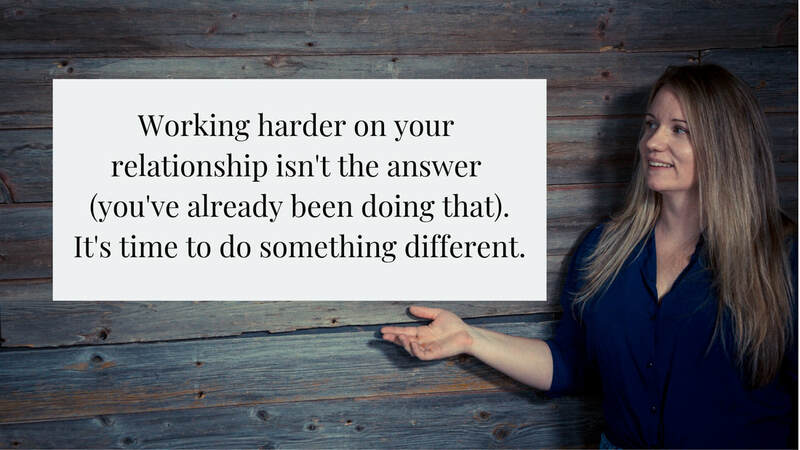 ​ instead of a relationship that you're always working on. Do you remember those moments when you feel completely in love with your partner? When you are laughing together and there is no one else in the world that you'd rather be with? Those times don't have to be interrupted by moments of fighting. Your relationship doesn't have to be hard. You can learn to deal with your differences in a way that brings you closer, instead of in a way that tears you apart. It's actually possible for you to have a relationship that feels loving and connected all of the time. I know because I've done it and I know that's it's possible for you too. From Conflict to Connection is about learning how to create the relationship of your dreams. Which I know feels impossible sometimes. You CAN fix your relationship. You'll learn how to understand yourself and your partner, so that you can start communicating in a way that actually works, instead of in a way that keeps you stuck and disconnected. Click here to contact Robyn! ​© 2019 Robyn Michon. All rights reserved.